Trying out tampons for the very first time can be a stressful experience. As a mom, it’s hard to know how to teach your daughter to use them. Where does one even start? My mom bought me a box of tampons and went over the instructions in the package. I wish she had done more because I still felt nervous. She told me I’d get better with practice and I did. However, with my own daughters, I wanted to take preparing them up another level with extra guidance and advice to create a positive first time experience with tampons. 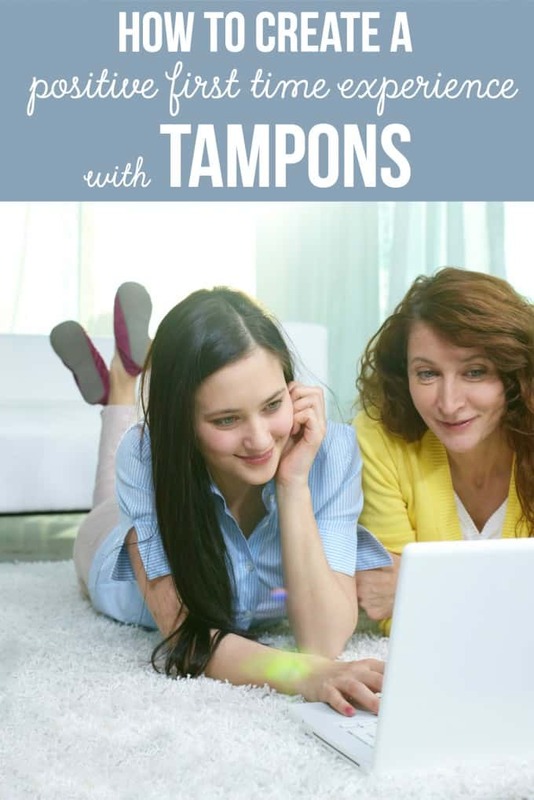 Today, I’m sharing helpful tips to prepare your daughter for using tampons based on my own personal experience with my own girls and what I wish my mom had done for me! 1. Talk about anatomy. Knowing your body and being comfortable with yourself is key. I think not understanding what was going on in that general region played into my fears of trying tampons. Teach the proper names and location via diagrams and give your daughter a mirror to look at her own anatomy if she wants. This video, How to Insert a Tampon, shares insight with diagrams so your daughter can better understand where the tampon fits. 2. Dispel any fears and answer questions. My daughter was worried that the tampon would get lost inside her and she’d never be able to remove it. I explained to her that was simply not true. The opening to the cervix is much too small for a tampon to ever find its way there. Tell her to ask away and there is no such thing as a stupid question. Brush up on tampons myths vs. facts if you aren’t sure of the answer yourself. 3. Work on relaxation. It’s easier to do anything, including inserting a tampon, when you are relaxed and at ease. When your body is tensed, it will be harder to insert a tampon and can leave you frustrated that it’s just not working! Teach your daughter to practice deep breathing, give her a soothing pep talk, play relaxing music or whatever you need to do to create a tranquil environment. I taught my daughter about using her kegel muscles so she could see what it feels like to tense and then let go. 4. Prep the room. Most likely, your daughter will be using the bathroom. She can lock the door for privacy and wash up before and afterwards. Ensure she has clean towels, washcloths and soap, a supply of tampons and a mirror. I also placed the tampon instructions pamphlet on the vanity for her to refer to. Tell her you’ll be nearby and to holler if she needs you. Do not hover outside the door or ask every minute if she is ok. She’ll call you if she needs you! 5. Discuss positions and how it works. When learning anything new, it’s best to understand how things work and be able to visualize it. Your daughter can mentally run through the process of inserting a tampon and what she will need to do. Share the different positions she can try like putting one leg up on the toilet or standing with her knees slightly bent. Tell her to do whatever feels comfortable for her. Don’t forget to mention how to remove a tampon which is basically just relaxing and pulling on the string. Easy! 6. 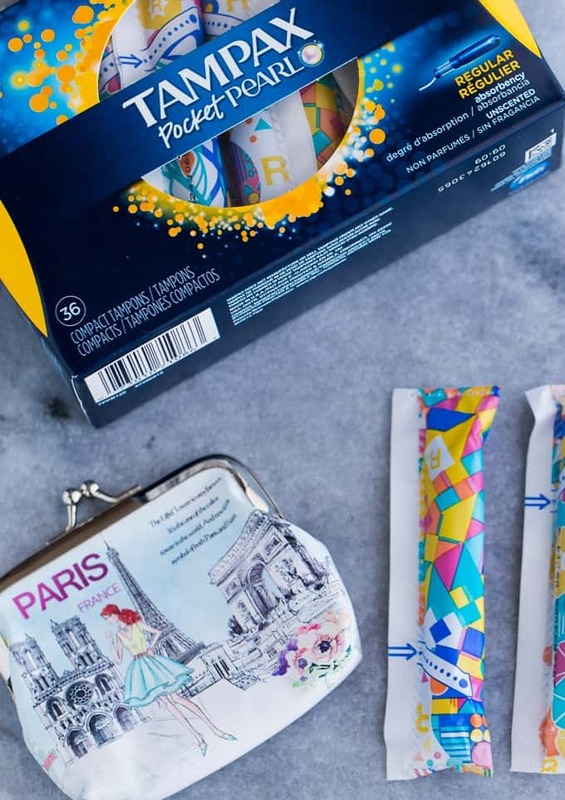 Start with Tampax Pocket Pearl tampons. 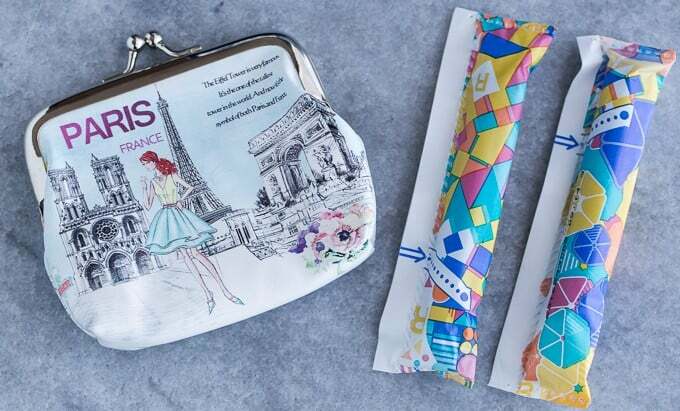 These tampons are perfect for teens for a number of reasons. For starters, they are small and compact, hence the name, “pocket” and are small enough to fit in the palm of your hand. Girls can easily fit them into a small purse or back pocket while they are on the go. Olivia can fit several into this tiny purse. The trendy wrappers are also functional. They are soft and quiet to open with their perforated edge. A must for public bathrooms at school or the gym! As for the tampon itself, it is the only compact tampon with the unique Built-In Backup™ Braid that helps stop leaks by channeling them back into the core. They also use FormFit™ technology to eliminate the gaps that cause leaks and add an extra layer of protection. Girls can be confident, carefree and protected! 7. Practice makes perfect. With Tampax Pocket Pearl tampons, it’s a matter of Ready, set click™. Take out a tampon from the package and show her how you pull out the inner tube until it “clicks” and locks in place. Let her try and do it so she can get familiar with the product first. Let your daughter know that it WILL get easier! It may take her a few tries to insert a tampon, but like anything, she will become faster and more comfortable inserting them and will be a pro in no time. My 17-year-old prefers tampons now because she can play sports and go for a run without having to worry about a pad getting in the way. Tampons can be worn from the very first time a girl starts her period. There is no right or wrong time to start. You know your daughter best so you be the judge about when is the best time to introduce her to tampons. I started my oldest daughter as soon as she started her period and I plan to do the same thing with my 11-year-old when the time comes. Then she’ll have the choice about whether she uses tampons, pads or both and decide what is right for her body. Choice is good! How did you prepare your daughter for tampons? I’d love to hear about your experience or what you plan to do when your daughter gets her period. I vividly remember the first tampon I used, it was very uncomfortable because I hadn’t inserted it properly but I knew no better at the time. So it’s very important to teach your daughter how to insert them properly and please remember to tell them the dangers of leaving them in too long. I disagree with having a virgin use tampons. I broke my own hymen trying to insert tampons at an early age. I wish I had known better.